Abstract: In the Western Tatra Mountains crystalline basement a bituminous matter was found in tectonic zones (faults, shatter zones). The tectonic zones run NE-SW cutting both the Variscan crystalline basement and its sedimentary Mesozoic cover. Oxyreactive Thermal Analyses of whole rock samples and Gas Chromatography–Mass Spectroscopy analyses of extractable organic matter revealed that the bitumens in question are heavy fractions of crude oils. The source rocks of the bitumens were marine shales and lacustrine sediments, relatively poor in organic material, accumulated in suboxic shelf conditions. The thermal maturity of the bitumens was determined as the oil-window stage (Rcs = 0.74–0.82 %). The terrestrial organic matter admixture was negligibly small, so we can suggest the age of the source material may be older than Tertiary (by comparison with the other Carpathian oils). The comparison with the Outer Carpathian crude oils showed that the Western Tatra bitumens resemble Jurassic oils more than Paleogene ones. Jurassic and Upper Triassic carbonates and black shales from the overthrust Tatricum sequences seem to be a more plausible source rocks for the investigated bitumens. The tectonic zones, rejuvenated after or during Miocene uplift of the Tatra Block served as the paths for bitumens migration. Abstract: The volcanic fraction of impure volcano-arenitic beds of the Reitano Flysch (Early Oligocene, Sicilian Maghrebian Chain) was investigated by petrographic, geochemical and radiometric techniques. Two distinct volcanic grain populations were recognized: (1) paleovolcanic clasts, Late-Permian in age and calc-alkaline in character, probably linked to late-Hercynian magmatism and (2) alkaline (potassic) neovolcanic clasts. As regards the alkaline fraction, it is difficult to link its provenance with the Oligocene-Miocene Sardinia volcanism. Indeed, this latter volcanism shows a distinct calc-alkaline character typical of subduction and/or collision-related magmas. We suggest that the volcanic sources of this alkaline fraction could be related to magmatic events close to the sedimentary basin and associated with extensional processes preluding the opening of new oceanic areas (i.e. Algero-Provençal Basin and Sardinia Rift). Abstract: A joint occurrence of high-latitude "boreal" and low-latitude "tethyan" calcareous nannofossil taxa has been observed in sediments of Late Campanian and Late Maastrichtian age, in the Outer (Menilite-Krosno) group of nappes (Waschberg Zone and Zdanice Unit) and Magura group of nappes (Raca and Bile Karpaty units) of the Outer Western Carpathians. The degree of influence of the "boreal" province was a function of the paleogeographical position of basins and geological time: the depositional area of the Outer (Menilite-Krosno) group of nappes was probably situated on the SE passive margin of the West European Platform. The calcareous nannofossils include both high-latitude species (Monomarginatus quaternarius, Neocrepidolithus watkinsii) and low-latitude ones (genera Ceratolithoides and Quadrum) in Late Campanian times. In Maastrichtian times the high-latitude phenomena dominates (common Psyktosphaera firthii, absence of Ceratolithoides kamptneri, Watznaueria: Micula ratio = 1:3). In the Magura group of nappes the depositional area of which is considered to be a high activity terrane of the Tethyan mobile Realm, the Late Campanian nannoflora is characterized by the presence of low-latitude species. The influx of high-latitude species is evident here especially in the Late Maastrichtian (higher numbers of Prediscosphaera stoveri and Nephrolithus frequens). A migration path can be supposed between the northern part of the Tethys and North European basins through the Peri-Tethyan basins (Polish Trough). In contrast, the Late Campanian section of the Münsterland Basin, which is included into the "boreal" province, yielded exclusively cosmopolitan and boreal nannofossils including Heteromarginatus bugensis. Abstract: The Rochovce Granite — a subsurface intrusion in the southeastern part of the Veporic Unit, has been dated by means of the single zircon U-Pb method. The dated sample represents coarse-grained biotite monzogranite of the first intrusive phase. The morphology and composition of the zircon crystals were controlled by cathodoluminescence and electron microprobe analysis. The resulting U-Pb data plot on a discordia line with a lower intercept age of 75.6 ± 1.1 Ma, and an upper intercept age of 1203 ± 500 Ma. The lower intercept age is interpreted as the crystallization age of the Rochovce Granite. Cathodoluminescence imaging excludes the presence of inherited cores or disturbing inclusions in the dated zircons. The intrusion and emplacement of the Rochovce Granite were most likely accomplished by NE-dipping, low-angle extensional normal faults, developed along the NW-SE sector of the Lubenik line at the contact between the Veporicum and Gemericum. 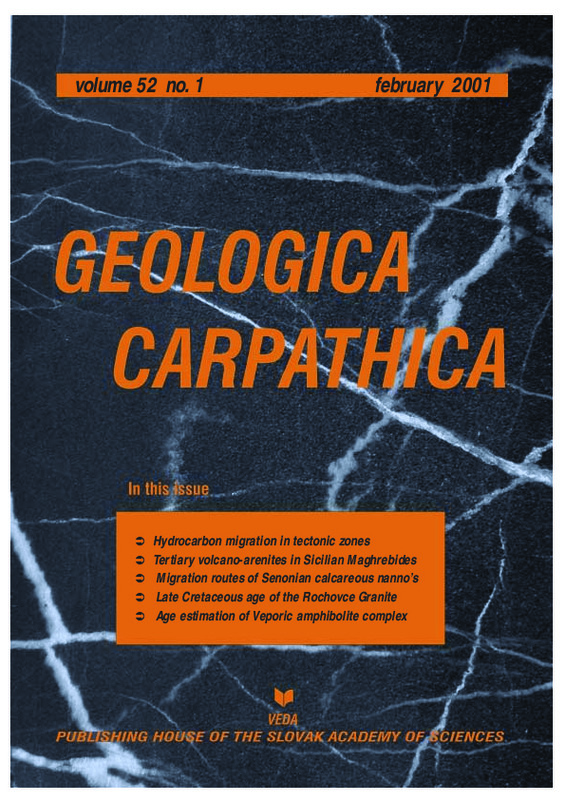 The new U-Pb single-zircon data prove the Late Cretaceous age of the Rochovce Granite and provide a further argument to recognize Cretaceous granite magmatism in the Western Carpathians. Abstract: The complex of Ky-Grt paragneisses, granitic to tonalitic orthogneisses, migmatitic gneisses and homogeneous to layered amphibolites was intruded by dioritic-gabbroic more or less concordant dykes and sills during the syn-metamorphic extension in the host regional metamorphic rocks. They now have the character of dioritic orthogneisses. The whole lithological sequence was then structurally unified during the late-metamorphic cooling and exhumation within the deep-crustal shear zone. The dioritic orthogneisses bear the features of pre-metamorphic compositional layering into cumulate-like hornblendite(±Px), gabbro-diorite, tonalite to trondhjemite. Magmatic layering has been transformed to subsolidus high-temperature layering along the extensional meso-shear bands filled with leucotonalitic melt seggregates crosscutting former magmatic structures at acute to medium angles. A new ductile strain relocalization enhanced mechanical differentiation of dark and felsic minerals into often isoclinally folded layers, with the crystallographic preferred orientation fabrics of amphibole, plagioclase and quartz indicating a layer parallel shear. The U-Pb zircon age of porphyric metadiorites 346±1 Ma (Early Carboniferous) is related to their magmatic emplacement, immediately followed by the high-temperature mylonitization. We also dated zircon of metatrondhjemitic orthogneiss from the layered amphibolite. An upper intercept age 514±24 Ma (Late Cambrian) is interpreted as dating the magmatic compositional differentiation of a gabbro-dioritic complex into cumulate-like hornblenditic, gabbrodioritic, tonalitic to trondhjemitic layers, which is an inherited feature in layered amphibolites (with blastic textures). The lower intercept age 348±31 Ma (Early Carboniferous) obviously reflects the time of regional-metamorphic event and formation of layered amphibolites. The whole composite (VZP-CB) structural complex is crosscut by plagiogranite-aplitic veins dated 233±4 Ma (Early Triassic).